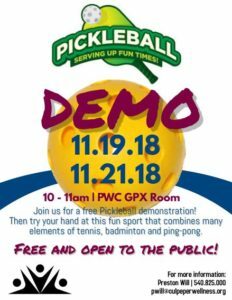 Add some pickleball fun to your holiday week! Stop by the Powell Wellness Center group exercise room for a demonstration of the sport and then try your hand at playing. The rules are simple and the game is easy to learn. Once you’re hooked, check out Culpeper Sport & Fitness for indoor pickleball play – this fast growing sport for all ages offers a great way to stay fit this winter, and year-round! The demos on November 19 and 21 are free and open to the public.